Originally designed as a business app for enterprise users, TigerText is like SnapChat for work. The mobile version lets you send text messages, pictures, or files that will automatically self-destruct. Available for Android, iOS. FREE. An online resource and 2013 American Business Awards winner providing news, opinion, analysis, case studies, and tutorials for engineers and engineering managers who design consumer and industrial products and systems. The blog of 2013 American Business Awards winner tw telecom, helping businesses of all sizes to access the most progressive, advanced technology in Business Ethernet and managed services. Sign on to this site to read interviews with nearly 1,000 proven entrepreneurs. 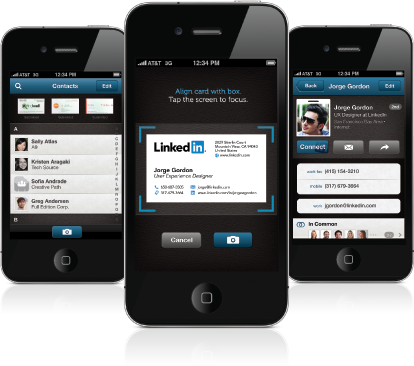 A free app, from LinkedIn, which takes a picture of a business card and converts it to a contact, and displays LinkedIn profile information and any shared connections. This Stevie Award-winning new version of SlideShark enables users to show PowerPoints from the iPad, iPhone, and iPod touch, and broadcast their presentations live over the Web. Free trial available for businesses. A blog that gives business advice for those working for companies or starting up a business on their own. It covers topics such as job search, social media utilization, advice for succeeding at your job, entrepreneurship, lifestyle design, and career growth. Marcus Sheridan and his team have created a community of passionate people all eager to learn together, with the focus on inbound and content marketing.